The Abbe-Koenig prism is a common type of roof prism used in many hunting optics to invert an image, or rotate it 180º. This type of prism is named after Ernst Abbe and Albert Koenig. It is constructed from two glass prisms that are optically cemented together in a symmetric, shallow V-shaped formation. Light enters one face of the prism assembly at normal incidence, and is then internally reflected from a 30º sloped face. After that, the light is once again reflected from a “roof” section made up of two faces meeting at a 90º angle. Next, the light is reflected from the opposite 30º face and exits the construction at normal incidence. Thus, the image is flipped 180º without changing its handedness, and so the prism is able to be used as an erecting system. The Abbe-Koenig design offers the highest light transfer of the roof prism designs, and is less bulky than the double Porro design. AKA the Abbe constant, this is the quantification of the amount of dispersion, or variations in index, for a certain spectral range. A high Abbe number means there will be less separation between wavelengths of light because the various wavelengths have nearly the same index of refraction in that medium. This means there will be less color dispersion and color aberration. Correcting lens aberration is vital to ensuring the best possible view through a hunting optic while maintaining a bright, sharp image. The best optics will correct Astigmatism, Chromatic Aberration, Coma, Curvature of Field, Distortion, and Spherical Aberration. Such a lens is designed to limit the effects of chromatic and spherical aberration by using a strong positive lens made from a low dispersion glass, like crown glass, coupled with a weaker high dispersion glass such as flint glass. This combination can correct the chromatic aberration for two colors, usually red and blue. The doublets are often optically cemented together (called achromat doublets) and are often used in compound lenses. An achromat doublet cannot completely correct chromatic aberration, but does eliminate it for two colors. To eliminate chromatic aberration for three colors, an apochromat triplet can be used. One of the “roof prism” or “right angle roof prism” designs used in optics, the Amici prism is named after its inventor, Italian astronomer Giovanni Amici. Similar to the Schmid design, Amici prisms revert and invert an image, while also bending the line of sight around a 90º angle by deviating a beam of light by 90º while simultaenously inverting the image. This type of prism makes an excellent roof diagonal in an optical system because it erects the inverted image. In fact, any optical instrument where it is desirable to take an inverted image from an objective, flip it right side up, and then bend it through a 90º angle, maintaining the correct visual orientation, can can benefit from the Amici design, and it is commonly used in spotting scopes. This is a type of extra-low dispersion (ED) glass also referred to as HD glass. It has a non-linear refraction of color wavelengths, which allows the lens designer to combine different types of glass together, getting the desired level of color correction. Using ED glass, a lense designer can reduce or even completely eliminate residual chromatic aberration, something that cannot be achieved with conventional optical glass. An aperture, in optics, is a hole or an opening through which light is transmitted. When we speak of aperture and hunting optics, though, we are referring to the diameter of the optic’s objective lenses in millimeters. This is the second number represented when describing a set of binoculars or other optics. For example, in the Carl Zeiss Conquest MC 3–9×40 Riflescope, the number 40 represents the aperture. This is an important number to think about when you are trying to determine how well a particular hunting optic will perform in low light conditions. 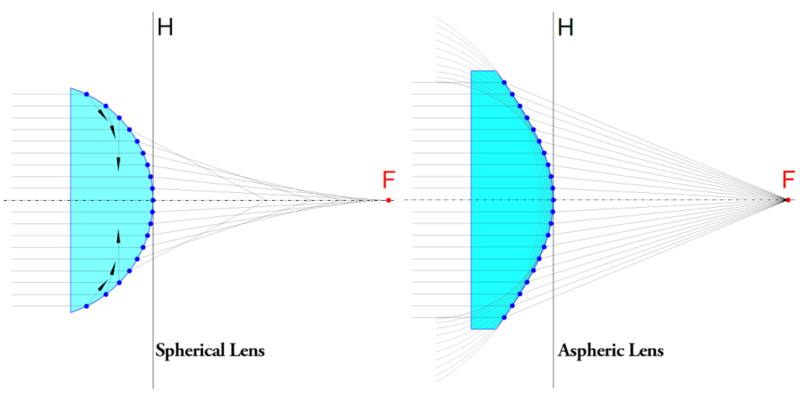 Apochromats, or apochramtic lenses (APOs), are lenses comprised usually of three elements that bring the light from three different frequencies to a common focal point. This provides better correction of chromatic aberration and spherical aberration than the more common achromat lenses. In an apochromatic triplet lens (see Apochromatic Lens above), three elements are used to reduce chromatic aberrations, which provides better correction levels than achromat doublets. A lens with a surface that is not perfectly spherical, convex, or concave is called an aspheric lens. In other words, different areas of the lens have different degrees of curvature, producing a more complex surface that can reduce or eliminate spherical aberration while also reducing other optical aberrations better than a simple lens. A single aspheric lens can also sometimes replace a much more complex multi-lens system, because of the use of different degrees of curvature. This means a smaller, lighter instrument that is sometimes less expensive. This performance and quality is not guaranteed just because it has the aspheric label, though, because many low end optics are made using aspheric lenses that are poured into a mold rather than being conventionally ground, which reduces the quality. The higher end of the quality spectrum sees aspheric lenses ground into much more sophisticated shapes than a spherical lens, a very expensive and difficult process but one that pays off with incredible results. Just like a sphere has a constant curvature, spherical lenses have the same curvature throughout their entire surface. Thus, the power of the lens at different points is variable, which results in peripheral light rays becoming defocused relative to the more centralized light rays. These lenses are easier to make, but their optics are worse. An aspheric lens, on the other hand, maintains a constant power even at the periphery of the lens, because the curvature is varied. This means the same focus for all light rays, both peripheral and central. These lenses are more difficult and expensive to make, but they yield better optics. When light rays are coming from off-axis, this forms an ellipse on the surface of the lens instead of a circle. This means that a dot can appear to be more like a line than a dot, resulting in image distortion. Astigmatism is similar to coma, except that coma aberrations are affected by the size of the aperture. BaK–4 prisms, manufactured from Baritleichkron, a Barium Crown glass, have a higher refractive index (1.569) than BK–7 prisms, so less peripheral light is “lost” through the non-total internal reflection. Optics made with BaK–4 prisms thus have higher light transmission and are better suited to low-light conditions than those using BK–7 prisms. Found in lower-priced optics, BK–7 prisms have a refractive index of 1.5168, allowing more peripheral light to be lost than the more expensive BaK–4 prisms. Edge-to-edge sharpness and light transmission suffer at least slightly with BK–7 prisms. In a catadioptric system, the image is brought to your eye using both refraction and reflection. This is achieved in most cases by way of curved mirrors, called catoptrics, and lenses, referred to as dioptrics. Catadioptric systems are used primarily in focusing systems like search lights, headlamps, early lighthouse focusing systems, optical telescopes, microscopes, and telephoto lenses. Celestron also uses the design in a small number of its spotting scopes. Also known as color fringing, achromatism, or chromat distortion, chromatic aberration is a type of distortion that results from the lens failing to focus all of the colors to the same convergence point. Color fringing at high-contrast edges, such as an edge between black and white, as well as a general softness of the image result from chromatic aberration. Basically, the different wavelengths of light don’t get focused onto the same focal plane. To correct this, high end optics often use ED glass. The optical and mechanical alignment of binoculars is called collimation. When binoculars are out of collimation, the line of sight between the two sides of the binoculars are no longer aligned. Many people describe the feeling of looking through binoculars that are out of collimation as being like having your eyes sucked out of your head. Inexpensive binoculars are often out of collimation straight out of the box, while high quality binoculars are carefully collimated, often with laser instruments, in a process that raises the price at the retail level. Coma is an aberration that forces rays from an off-axis point of light to create a trailing “comet-like” blur moving away from the optic axis. What this often looks like is an image with a sharp center, but increasing blur toward the edges of the image. Bending the lens can correct this with a single-lens setup, but a combination of lenses symmetric around a central stop provides more complete correction. There are two types of glass used in manufacturing achromatic lenses, crown glass and flint glass. Crown glass is harder than flint glass, and has a lower index of refraction as well as a lower dispersion. Crown glass is produced from alkali-lime (RCH) silicates, which have approximately 10 percent potassium oxide. Crown glass is one of the earliest low dispersion glasses. Curvature of field, also known as Petzval field curvature, is a very common optical problem. Basically, it causes a flat object to appear sharp in just certain parts of the image, instead of being uniformly sharp across. This happens because the optical elements are curved, and project the image in a curved manner instead of flat. This is the distance from near to far that displays in crisp focus at a given setting of the focus adjustment or at a certain distance. Typically, depth of field will decrease as the magnification increases in an optical system, which is a distinct disadvantage of high magnification hunting optics. This is why depth of field is normally more important when comparing spotting scopes, for example, than binoculars. Depth of field also changes with the distance observed, decreasing as the distance observed increases. Roof prisms are often given dielectric coatings to increase their light reflectivity. The roof prism design has one problem, which is the fact that one of its surfaces does not have total internal reflection. The dielectric coating helps improve on that flaw, allowing better light transmission. In many cases, an aluminum mirror coating, with a reflectivity of 87% to 93% is used. In other cases, a silver mirror coating with a reflectivity of 95% to 98% is used. Dielctric multilayer coatings allow the reflectivity to be improved without using a metallic mirror coating, improving the light reflectivity by more than 99% across the entire visible light spectrum. Thus, the reflectivity is improved even more than a metallic mirror coating provides, and the brightness is almost identical to that perceived by the naked eye with clear, high contrast images displaying completely accurate color reproduction. A unit of measurement, this reflects the optical power of a lens or curved mirror. One diopter is equal to the reciprocal of the focal length, as measured in meters. A 4-diopter lense brings parallel rays of light to focus at 1/4 meter, for example. This is a separate eyepiece-focusing tool, typically found on the right lens of a set of binoculars, that allows for adjustment of the lenses separately to allow for differences in each of your eyes. The diopter adjuster is essential to correctly focus your binoculars. On spotting scopes and monoculars, the diopter adjuster is used to allow for the use of the optic without eyeglasses. The capability for adjusting the hunting optics to the varying visual acuity of a person’s eyes. This allows one lens to be adjusted to provide compatible focus when the viewer’s eyes have different visual capabilities. On single-lens optics, dioptric correction allows eyeglass wearers to use the optic without their eyeglasses. Dispersion, in optics, is a phenomenon in which a wave’s phase velocity depends on its frequency, or when the group velocity depends on the frequency. Dispersive media are media having just such a property. The term is often referred to as chromatic dispersion, emphasizing the wavelength-dependent nature, or group-velocity dispersion (GVD) to emphasize the role of the group velocity. Long story short, this is the effect of, for example, light being dispersed into components of different wavelengths. For example, a rainbow is created when white light is dispersed into the different colors (different wavelengths) seen. There are a number of different types of distortion possible in optics, including aberrations like spherical and chromatic aberrations. In addition, though, there are other types of distortion, such as Pincushioning or Barreling. In these types of distortion, straight lines can look like they are curved when looking through the device. * Barrel Distortion – Straight lines appear to curve outward * Pincushion Distortion – Straight lines appear to curve inward * Roller Ball Distortion – Sometimes, if there is neither barreling or pincushioning and you have a totally flat image, a ball seems to roll across an image as you pan across it. This is the amount of light rays that enter the objective lens and then exit the ocular lens, and is important in determining how well a hunting optic will perform in low light. Please see our full article explaining what Exit Pupil is. ED glass is used on the lenses of some high-end optics to alleviate the effects of chromatic aberration. The designers of multi-element objective lenses have more options with ED glass, allowing them to focus and direct the wavelengths of light more effectively. This way, they can minimize aberrations, particularly chromatic aberration. The better aberrations are controlled, in general, the cleaner and brighter the image will appear. Optics manufactured using ED glass typically transmit clearer and sharper images to your eyes. Related to eye relief, eyecups keep the distance between the oculars and your eyes, while also keeping stray light from entering your eyes when you are using the optic. Many eyecups are made from rubber, rolling up or down depending on whether or not you wear eyeglasses. Unfortunately, constant rolling tends to break the rubber eyecups. Some eyecups are made to slide rather than roll. These, unfortunately, can be hard to keep in place. Yet a third type of eyecup twists up and down (often called helicoid eyecups), and can be left in any position from all the way up to all the way down. These sometimes have click stops at certain intervals and are labeled with the eye relief distance for each stop, allowing you to achieve the perfect eye relief for your eyes. Eye relief is the distance between an optical instrument can be held away from the eye and still provide the full field of view. The calculation of this distance is quite complex, but generally speaking, the higher the magnification is and the larger the intended field of view, the shorter the eye relief will be. Vignetting can occur when eye relief is too short, around the periphery of the vision. Because of this, if the viewer’s eye is outside this distance, a reduced field of view will be seen. Eyeglass wearers, in particular, hold eye relief to be very important. The eye of an eyeglass wearer is typically further from the eyepiece, necessitating a longer eye relief to still see the entire field of view. An eyepiece usually houses the lens closest to the eye when looking through an optic, hence the name. This usually consists of several “lens elements,” collectively called the ocular lens or eyepiece lens, contained within a housing with a barrel at one end. This barrel is shaped to fit into a specific opening of the optical instrument it is attached to. The image seen can be focused by moving the eyepiece nearer to and further from the objective lens. Most optics use a focusing mechanism to move the shaft the eyepiece is mounted to, eliminating the need to adjust the eyepiece manually. Also called the f-stop, focal ratio, f-ratio, or relative aperture, the F-number is the ratio of the lens’s focal length to the pupil entrance diameter. To calculate the F-Number, you must divid the focal length of an optic by the diameter of the entrance pupil. These improve the sharpness of an image around the edges, lowering distortion by reducing the curvature of the field aberrations that can occur when focus is placed on the center of the field of view. Focusing on the center of the field of view causes the edges to go out of focus, or for the center to go out of focus when focusing on the images. Field flattener lenses produce sharper, clearer images even at the lens periphery, and are used in most high-end optics. This number indicates the horizontal width of the image you see when you look through your optics at a certain distance. Each optical structure of a pair of binoculars, spotting scope, riflescope, etc. is different, so models with the same magnification can still have different fields of view. The number can be expressed as an angle, but we always refer to it as a number of feet per thousand yards of distance. Flint glass is the other of the two types of optical glass used to manufacture achromatic lenses. Flint glass has a low Abbe number, a higher dispersion, and a higher index of refraction than crown glass. A concave lens of flint glass is often used alongisde a crown glass convex lens to manufacture an achromatic doublet lens, because the two types of glass compensate each others’ optical properties. This reduces chromatic aberration. This is a class of non-oxide optical glasses, composed of the fluorides of various metals. Optical elements made from calcium fluoride are often used in telephoto lenses to correct color aberration. However, fluoride glasses are being replaced with the use of low dispersion glasses, because these glassess possess higher refraction index, better dimensional stability, and are less fragile. This measurment indicates how strongly the optical system converges or diverges light. A system with a shorter focal length bends the rays more strongly, bringing them into focus in a shorter distance. This is not to be confused with magnification, but is rather the ability of an optical system to focus effectively at various distances. Galilean binoculars are so named because the concept was first used in the telescopes made by Galileo Galilei in the 17th Century. These types of binoculars use convex objective lenses with concave eyepiece lenses, so prisms are not needed to erect the images. These are also known as opera glasses, and are used for viewing objects not very far away. Any binocular with an objective of 60mm or more are called giant binoculars. Giant binocularts are often used for astronomical viewing. These are also referred to as twist-up eyecups, because they twist up and down using a helicoid mechanism. This allows them to be left at any position from fully up to fully down, and some even have click stops at regular intervals with the eye relief distance for each stop marked on the cup. This allows you to get the perfect eye relief for your vision. Sometimes shortened to IPD, this is the distance between the exit pupils of a pair of binoculars. It needs to correspond with the distance between the center of one pupil and the other in your eyes (also called interpupillary distance). IPD is crucial in the design of binoculars, since both of the user’s pupils need to be positioned within the exit pupils of the bins’ viewing system. Binoculars manufacturers can get data for setting the interpupillary distance of their binoculars from a variety of anthropometric databases such as Military Handbook 743A and the 1988 Anthropometric Survey of US Army Personnel. These particular databases provide the IPD for each gender and sample size with mean and standard deviation, minimums and maximums, as well as percentiles. Most high-quality hunting optics have at least a single layer of anti-reflective coating on the air-to-glass surfaces to help with light transmission, producing brighter images with improved contrast. Please see our full article explaining anti-reflection lens coatings. Most of the spotting scopes on the market utilize lenses and prisms, but the Maksutov-Cassegrain design, often referred to as a Mak, is quite a bit different. Usually seen in telescopes, the Mak utilizes lenses and mirrors to bring the image to your eye, one of several catadioptric designs. One of the lenses, called a corrector lens, helps to eliminate aberrations in the image that’s delivered to the eyepiece. Maks are very uncommon in spotting scopes, although Celestron does manufacture a few. These scopes are well-suited to visual use and planetary imaging, making them great for amateur and backyard astronomy. This is the process of filling an optical instrument, such as a spotting scope, binocular, or riflescope, with zero grade or almost pure nitrogen, purging the optical chamber of all moisture and oxygen. This is done to prevent virtually any fogging or oxidation of the optics. In any hunting optic, this is the large lens at the end of the device, opposite the eyepiece and closest to the viewed subject. This is the lens that gathers light into the optic, combining convex and concave lenses to minimize chromatic aberration, giving you a clearer image. The ocular lens is the small lens in the eyepiece of any optic device. Usually, this is the lens closest to the eye and is often smaller than the objective lens. This is not always the case, though, as seen in some porro prism binoculars and spotting scopes where the ocular lens is the same size as the objective lens. The ocular lens usually consists of several “lens elements” contained within a housing with a barrel at one end. The ocular lens magnifies the image created by the objective lens. Field-flattener lenses are often used on eyepiece lenses to correct lens aberrations in which the peripheral area of an image is out of focus. In order to keep light in correct color phases, phase correction coatings are used on roof prisms to enhance resolution, contrast, and color fidelity. These coatings keep light in the correct color phases, so they produce images with better contrast and resolution, along with better color reproduction. You’ll only find this on high end optics. Any change the occurs in the phase of one quantity is called phase shift, as is the difference between two or more quantities of a wave or phase. Manufacturers of high end roof prism optics will use phase correction coatings to minimize this, preventing the deterioration in an image sharpness caused by light waves reflecting at the opposite faces of a roof prism. Prisms are used to correct an inverted image, and come in two basic varieties for optical use. These are porro prisms and roof (Dach) prisms. Porro prisms are what causes a pair of binoculars to have their classic two-stage profile, while roof prisms allow for straight optical channels. It used to be true that porro prisms had superior optical qualities, but today’s roof prism designs with high reflective and phase correction coatings can produce an image quality that rivals or even exceeds porro prisms. This design was invented by Ignazio Porro in mid–19th-Century Italy. One advantage of this design is that all of its reflective surfaces are completely reflective, so there is no light loss and such binoculars are easy to produce. The optical path, however, is bent like the letter Z, making the system take up considerable space and cause the bins to be larger than those with a roof prism. You can tell a Porro prism design from a roof prism design, because the objective lenses and eyepieces will not be in line with each other. Light bends, or refracts, when it travels through two transparent substances of different densities. For instance, when light leaves air and enters glass, or when it leaves glass and enters air, the light will refract. Under ideal conditions, all light will bend equally, but real life conditions dictate that light bends at around a 95 percent quantity, with 5 percent of the light reflecting back into the first surface. To combat the consequences of partial reflection, scientists devised chemical coatings to apply to the lens coatings, increasing the ability of the lens to transmit light. Sometimes referred to as a Dach prism because of the German word for roof, this describes the roof-like shape of a prism. Optics with a roof prism design maintain the objective lens and eyepiece in line with one another, aligning the internal prisms instead of offsetting them, as in Porro prisms. The drawback to the roof prism system is that the first prism has one surface without total internal reflection, resulting in the loss of some light. Coatings are sometimes used to increase the reflectivity of the surface, known as dielctric coatings. Also, highly advanced technology is used to produce a roof surface of the second system with as precise an edge as possible, so that it delivers sharp images without a flare or a double image. This is why it is important not to try economizing on roof prism bins, instead buying the best you can afford. Binoculars, in particular, but also spotting scopes, tend to come in two main design styles depending on the type of prism system used. This is either a Porro prism design or a roof prism design. It is quite easy to tell the two apart from one another: if the objective lenses and the eye pieces are in line with one another, you’re looking at a roof prism design. On the other hand, if the two are offset from each other, the optic is using the Porro prism design. Roof prism optics tend to be more compact, but to achieve the same optical quality as Porro prism models they can be more expensive to manufacture. This is less the case now than it used to be, but you still find some roof prism optics priced higher than Porro prism designs. The relative brightness index compares how well binoculars with different size exit pupils will perform in the dark. Typically, the higher the relative brightness, the better the light transmission will be. However, this index does not take into account optical quality or coatings, so the number should be taken with a grain of salt or only used for rough estimates. A bundle of light rays coming from one point on the optical axis is often focused at a different place than the focused point, depending on how far it is from the optical axis when the light incidents. This deviation is caused by variations in angles of each incident light ray, and can cause something that should be a focused point appear as a blurred circle, instead. Making lens diameters smaller reduces such spherical aberration. As light passes through an optic, a certain percentage of it gets lost in absorption and reflection. The amount of original light remaining will vary from between 50 percent and 97 percent, depending on the quality and number of optical glass elements used in the lenses and prisms. This is a crucial factor to consider, because it determines the actual brightness of an observed image. For most high quality binoculars, this figure will typically be above 90 percent. This is the amount of resolution you can see when you view in dim light, or in twilight. It is a mathematical formula dealing with the size of the objective lens and magnification, and how the magnification contributes to the optic’s ability to show detail in dim light. It does not, however, take into account the quality of the lenses or their coating, so it is another number that can only estimate the performance of different configurations of optics in low light conditions. Typically, the higher the twilight factor is, the better the resolution of the optic will be when observing something in low light. This is an anti-reflection coating process customized for every lens element in the optical path. This allows the best possible light from the front glass all the way to the eyepiece, giving optimum brightness and true color across the entire light spectrum. When the eye relief is too short, you can get a dark area around the edges or periphery of your field of view. This reduction of an image’s brightness or saturation at the periphery compared to the image center is known as vignetting. It’s a great effect to apply to a photograph, but you don’t want it in your binoculars or riflescopes.